This new forum deserves to be broken in properly! Everyone break out your favorites! Wow! That baby is sharp. 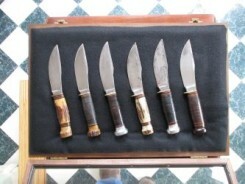 There's a few I've had rehandled...# 23 in mammoth ivory and some # 73's in elk stag and mammoth. WOW now I would call that a completed goal. I am sure your Grand-Kids will never for get YOU. Fantastic unique sweet jewels absolutely marvelous set. Nice collection LC, I sure am lusting after that Grits and Molasses Cuban. There is two 2007 Acrylic Cubans I still am trying to add to my collection; Grits and Molasses and Fall harvest. That for sharing those photos. Thats a great set of 06's j5109...I wish I'd started collecting GEC when they came out...Adam your customs are super...I think GEC's are an excellent knife to customize, I'm thinking of getting a couple flat bolster 73's to have rehandled. Started putting these stag's together about a year and a half ago...I'm missing a few, but I'll eventually find them! Here's one MM did up for me about two years ago. A 73 with mammoth & file. Also a couple of Open House acrylics. If it's meant for me to have it, it'll still be there.